Western CT State University Archives' Digital Collections | The Neglected Side Of Trade-Unionism: The Boycott. The short pamphlet which describes the strategy of using anti-monopoly legislation to combat unions and their orchestrated boycotts. Merritt, Walter Gordon. 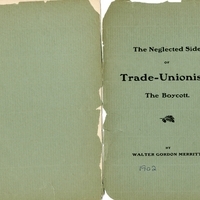 “The Neglected Side Of Trade-Unionism: The Boycott.” Walter Gordon Merritt, MS014. WCSU Archives, 3 May 2018. Accessed on the Web: 24 Apr. 2019.